Few weapons have the capability to quickly and quietly dispose of a semi-distant enemy. 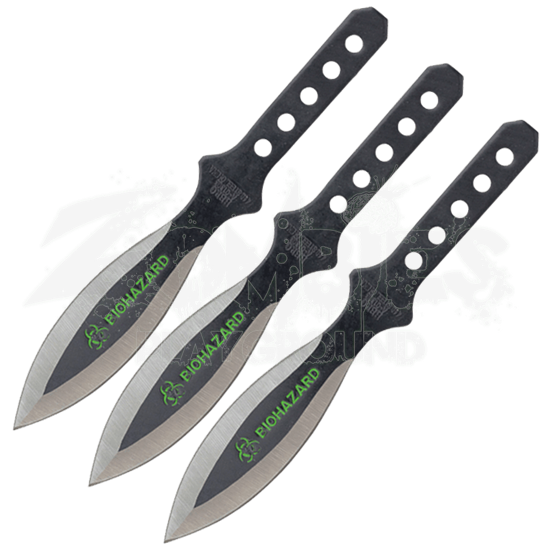 When armed with the 3 Piece Biohazard Black Leaf Blade Throwing Knives, being ready for survival situations is easy for rookies and experts! An excellent craft of modern intuition, these throwing knives are forged from 440 stainless steel in the classic double-edged design of a leaf blade. Five circular cutouts line up along each handle to ensure that balance is maintained for that perfect strike! Each knife is given a black finish designed to highlight the blades edge, a bright green biohazard symbol embedded in the blade for a color contrast everyone can appreciate. Store these deadly throwing daggers in the hardy nylon sheath for an effective way to remain armed at even your most vulnerable moments. 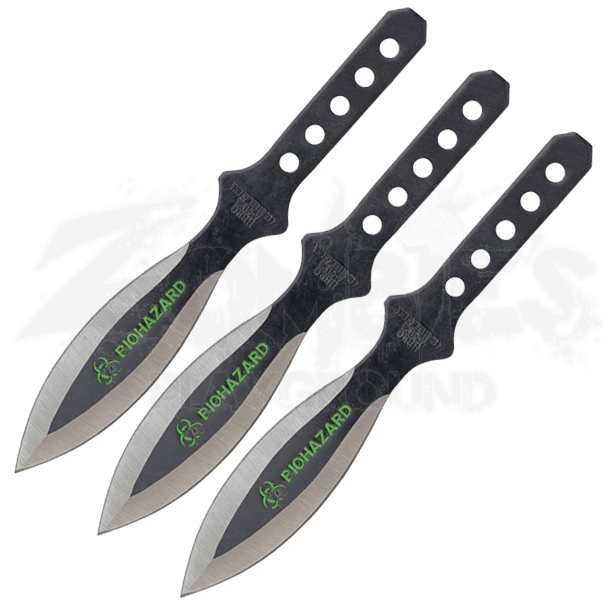 Danger may strike at any time, so grab the 3 Piece Biohazard Black Leaf Blade Throwing Knives and never let your guard down!